The Haiti Cultural Exchange presents Mizik Ayiti! in collaboration with Clocktower Productions, Pioneer Works, and Radyo Shak. Join us for an evening of DJ sets, live performances, food, and Clocktower's mixtape cassette release, all celebrating Haitian culture. 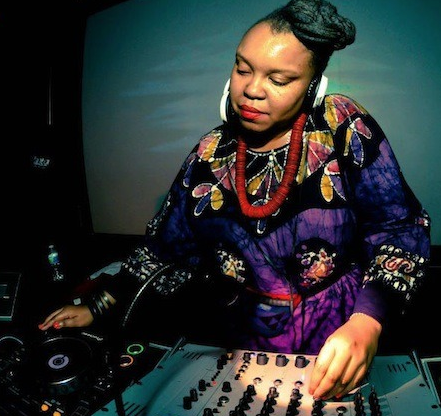 Sabine Blazin is a DJ focusing on the exposure and pleasure of African Diasporic music. Her Oyasound EP is currently in the works. Sherley St. Fort Davilmar is a performance artist and is the founder of a dance company La Troupe Zetwal, started in 2001. Rodney Okai Fleurimont is a self-taught percussionist and MC. He is in several bands that are based in Brooklyn, all representing the music of the African Diaspora. He is the lead vocalist and percussionist of Brown Rice Family and a percussionist/vocalist for Underground Horns. Veroneque Ignace is dedicated to achieving her long term goal to seamlessly combine her passion for Haiti, people, medicine, and dance in such a way that allows for large scale healing using choreography and writing. The event celebrates the collaborative project, Radyo Shak, organized by Clocktower Productions and Richard Fleming on the occasion of the 4th Ghetto Biennale in Haiti, in collaboration with Pioneer Works and with media sponsorship and radio support from the Haiti Cultural Exchange. On the night of Mizik Ayiti, Clocktower releases a limited run cassette mixtape of archived Radyo Shak recordings in both English and Kreyol, including snippets of slam poetry, traditional Haitian recipes, historical tales, interviews with biennale artists, Rara street festivals, twoubadou crooners, and all vinyl DJ sets. Mizik Ayiti! is part of HCX's Selebrasyon! 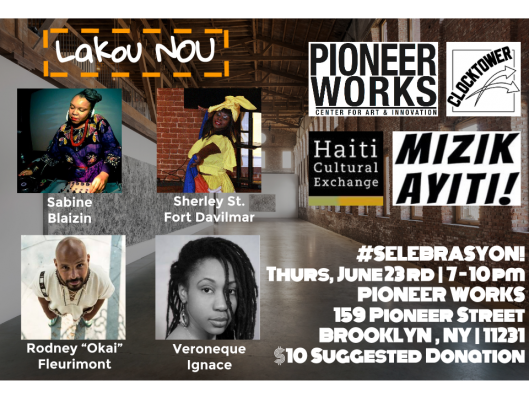 event series --New York City’s only festival dedicated to the promotion of the highest caliber film, dance, music, literature, and visual art of Haiti and its Diaspora. 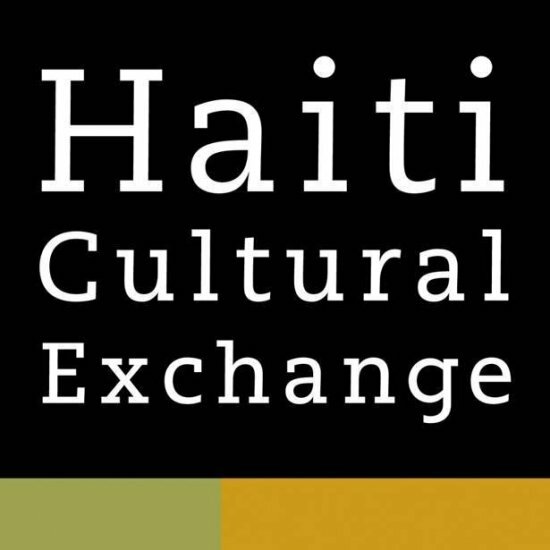 HCX launched this biennial celebration in 2014 toward increasing engagement with Haitian Arts & Culture in one of the largest Haitian Diaspora communities in the world. The second installment of the festival will be presented as a part of HCX’s Spring & Summer 2016 Season centering on the theme of Libète/Freedom. 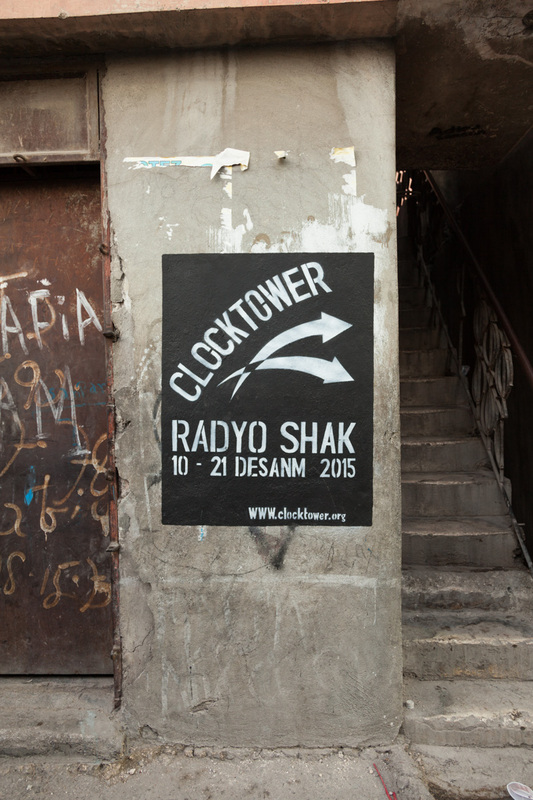 Radyo Shak was the independent broadcast voice of the Ghetto Biennale lakou 2015. 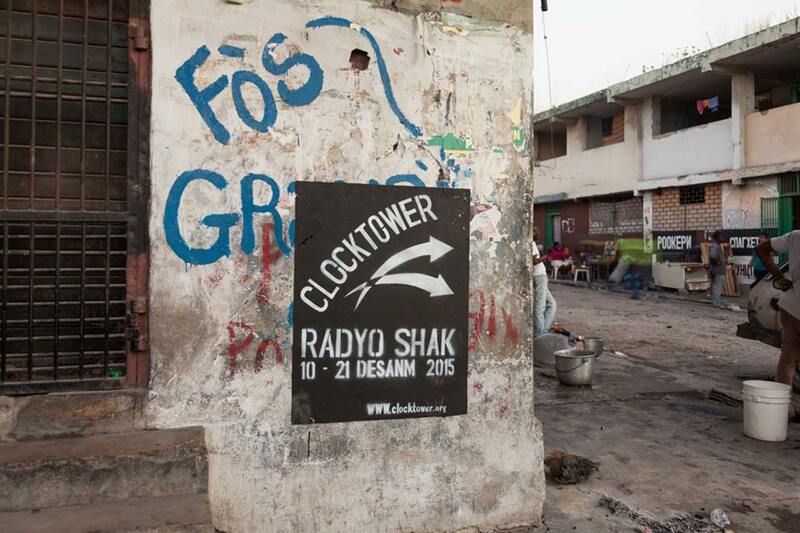 Based in a shack in the Grand Rue Atis-Resistans compound of Port-au-Prince, Clocktower Radio's Radyo Shak broadcast Haiti's biennale happenings, from December 10-21, 2015. The Radyo Shak hosted freeform radio in the bidonville, including Rara bands, interviews with locals, artists and writers, project updates, and Haitian revolutionary history over FM radio, Internet radio, and analog broadcast amplified through speakers and PA. This year, in collaboration with Clocktower Radio, the 4th Ghetto Biennale of Haiti will have its own community and international radio station, broadcast directly from a specially constructed shack in the Grand Rue area of Port-au-Prince. We're calling it Radyo Shak. Follow the Clocktower team's adventures through the streets of the bidonville and in the Radyo Shak radio headquarters, and stay tuned as a roster of over 60 artists, film-makers, academics, photographers, musicians, architects, and writers congregate in the Grand Rue to make and witness art. Keep an eye on this page for updates straight from Haiti! Find out more about Radyo Shak's all-Haitian pre-programming: HERE. The Radyo Shak's co-creators Richard Fleming and Jake Nussbaum get together in Red Hook for a closing discussion about the project's biggest surprises, lessons learned, ideas for improvement, and what the future holds, including their dreams for a mobile radio station that moves from neighborhood to neighborhood in Port-Au-Prince. 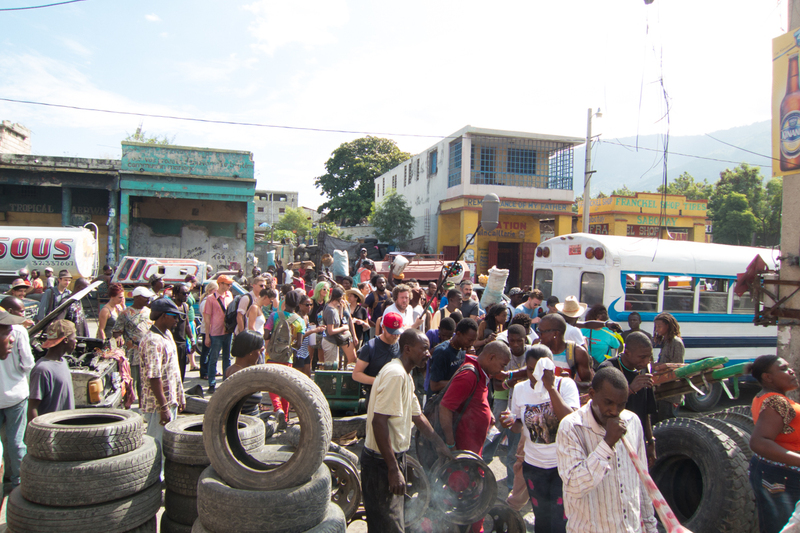 The Radyo Shak project spanned over 6 months and surpassed 100 individual radio programs in Haitian Kreyol, English, and French, primarily documenting the artistic community of the Grand Rue and their collaborations with the scores of visiting artists to the 2015 Ghetto Biennale, in addition to profiling many artists of the Haitian diaspora in Brooklyn. Broadcasting in FM to the local community and streaming over the internet, the pirate station became a social hub and a place for creative exchange, often in unexpected and surprising ways. The end result is a multi-voiced celebration of creativity in a starkly underserved neighborhood; a dynamic ethnography of a Haitian "lakou;" and a document of a local culture's collaboration with the international art scene.